Anguib Beach. These two words sent a tinge of excitement when I read that it was our destination. For years, I’ve wanted to reach its pristine waters and white sandy shore but failed despite visiting the province several times. But reaching Anguib Beach in Cagayan is not easy. First, its in Sta. Ana, the northeasternmost municipality. Second, for now, the fastest way to get there is a motorized outrigger boat (banca) from the wharf. And third, because it is at the northern tip, travel is limited especially during the amihan or the northeast monsoon when the sea is rough. But that is also its allure. We were soaking wet from the ten foot waves that pummeled our boat ride merciless. I had to grasp hard at the wooden bar, wiping yet again the salty splash on my face. But we were at the height of the amihan, at the edge of the Pacific Ocean as wave after wave pounded our banca. But once we neared the shores of Anguib, past the reef break, the waves lessened and the ordeal bearable as we made our approach. It wasn’t really the best of days. The overcast sky was making it somber. No blue skies that would have made for wonderful saturated beach photos where colors can pop. But it wasn’t enough to dampen my resolve to enjoy Anguib. Although it was cold and windy, I hurriedly placed my bag at the cottage where we assembled, ran to the beach and took the plunge! The water was cold! Colder than I expected but refreshing. The sea is clear that you can still see your feet around a meter and a half below. I spent around 20 minutes in the water until the temperature became unbearable, chilling to the bone. I washed up, changed my shirt and grabbed my camera. 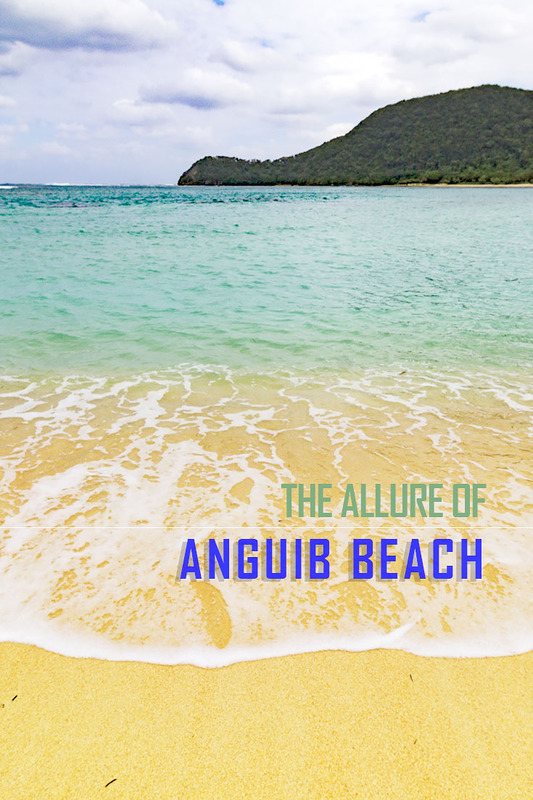 Except for us, much of Anguib Beach’s stretch was deserted. Two ladies were also cleaning the shore, gathering the sea debris into neat piles. Several meters away, a group of snipes were busy foraging. Talisay and casuarina trees growing a few meters from the shore, with some of the former bedecked with hammocks, dancing in sync with the leaves, swaying. It’s actually a great place to hang out as the breeze is cool with the trees filled with birdsong. I walked farther from our base, tracing the stretch of white sand, past a few trees and some fishermen’s houses. Past a low wall marking another property and into a rocky outcrop where I stayed for a few minutes, taking photos and looking at a towering rocky islet. The spot was silent except for the incessant murmurings of the sea. I love the stillness of the place. I love that it is distant with the minimal comforts, for now. It’s ideal to just laze the whole day and do nothing but walk at the water’s edge, barefoot and feel the cool waters licking your feet or silently sitting at the rock outcrop and stare into the distant wave breaking at the reef. Or walk among the tropical vegetation and observe insects or just lie at the hammock and doze off to the rustling of leaves and coming waves. Perhaps, I should just come back here and stay for days. It was already noon when our party started to pack up after a short merienda of hot macaroni soup which was actually a welcome treat as the weather was chilly. Our fleet of bancas passed a beautiful mangrove forest on our way to our lunch place at another beach resort where we gorged on seafood: fish, seaweed, and especially lots of lobsters. Anguib Beach in Cagayan is forlorn, distant. Hard to reached but once there, its pristine white sandy shore is a fitting reward for the persistent traveler. GETTING THERE: Anguib Beach is best reached by renting an outrigger boat at the San Vicente wharf. From Manila, there are Florida buses bound for Sta. Ana and hire a tricyle for San Vicente. You can also travel to Tuguegarao either by bus or plane and ride a van at the terminal for Sta. Ana. It’s also possible to hire a tricycle from the town and motor to Nangaramoan Beach which is adjacent and hike to Anguib Beach. This trip was part of Lakbay Norte 6, made possible by North Philippines Visitors Bureau (NPVB) which promotes travel and destinations in North Luzon.